Two days into it and 45 minutes from its scheduled end at 5 p.m. this afternoon, the county-wide economic development summit got real. It was 4:15 this afternoon, 45 minutes before the scheduled end of the county-wide economic development summit. The assembly was high on sloganeering (“one team, one voice, one message”) and even higher on self-congratulations over five “strategic goals” distilled from 10 hours of discussion. The moderator, Don Upton, was pumped—and pumping others—over getting some “action” out of those goals by setting more “task force” meetings to flesh out the five strategies and come back to yet another county summit on March 18 (and another $7,250 for Upton and his Tampa-based consulting firm). Marriage Encounters: Can This Man Bring Flagler Together for $1,100 an Hour? 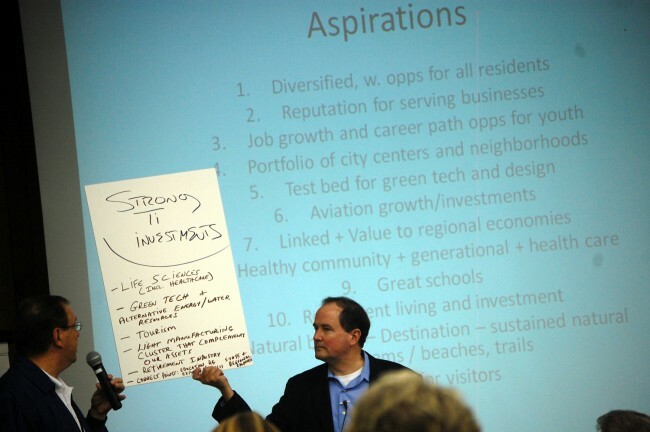 Economic Development Summit: Can Flagler’s 33 Elected Get It Up? Then the meeting got real, especially when the words one message were added to the rest of that slogan. Upton intervened, assuring Landon that “we are not developing a brand slogan or a tag line at this time.” Only a few minutes earlier, Upton had responded to one suggestion by saying that the slogan would be bannered at the top of his reports. Landon wasn’t saying anything new himself. He was verbalizing the very reason why the summit was called in the first place. Last January, when local governments met in their first such meeting, without a moderator, they discovered that they had fundamental differences: Palm Coast and Flagler Beach were not in agreement with the county’s and Bunnell’s plan to add a sales tax that would fund economic development. 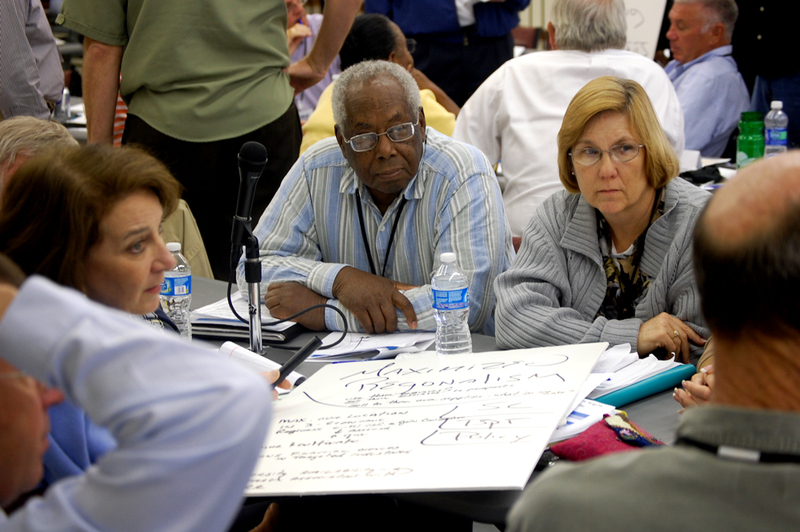 Nor was there agreement on who would lead a county-wide economic development organization. They didn’t even have an overall plan on what sort of economic development they might all agree on. The governments agreed to call in a facilitator to help them see through. In walked Upton and this weekend’s two-day summit. But Upton never touched on two of the three fundamental disagreements, and he discovered, late in the day, that the third—the five strategic plans—did not necessarily have a consensus. Robbie Richmond, president of the Flagler Home Builders Association, said he could not believe that any voter would object to the five strategic goals. Jane Mealy, the Flagler Beach City Commissioner, raised her hand from the opposite end of the room and reminded Richmond that in Flagler Beach at least, voters very much would object. Palm Coast council member Frank Meeker said as much, reminding the assembly that the elected have a general fund budget to look after, and that some of those goals would cost money. “The taxpayers are not all lined up on this issue,” Meeker said. The “strategic goals” were not significantly different from Friday’s wish-list discussion of Flagler’s economic future, merely more categorized: “Exceptional customer service” for businesses dealing with local government; an educational system from early childhood to college and technical schools rich in links; a “robust entrepreneurial environment” where all business—small, new, mom and pop, corporate—is prized; recruitment of targeted industries; and maximizing “regionalism” in local policy-making. “I want to wrap up that we make sure that we take some action from here,” Upton said, but the action he had in mind was more meetings. Just before Landon weighed in, Palm Coast Mayor Jon Netts summarized the two days’ work in one sentence, delivered—to little effect—to the moderator: “This is not the linchpin to economic development. This is part of the process.” Don Upton, the moderator, thanked him and moved on. Netts earlier had characterized some of Saturday afternoon’s discussions as “loosey-goosey,” though he said that could be the impetus for everyone to “tighten things up.” He’d also reminded the assembly that targeting industries is a thrice-repeated exercise in the county (by the city, the county and Enterprise Flagler). The list of targeted industries hasn’t changed much. Several people spoke glowingly of the collegiality of the two-day meeting, terming it unprecedented for enabling various governments and interests to speak with each other at length and toward the same ends, if not necessarily the same methods. was done by the late nationally and internationally known John Simonds, a partner in the firm of Environmental Planning & Design, offices were located in Pittsburgh, Pennsylvania and Miami Lakes, Florida. He/they were retained by I.T.T. 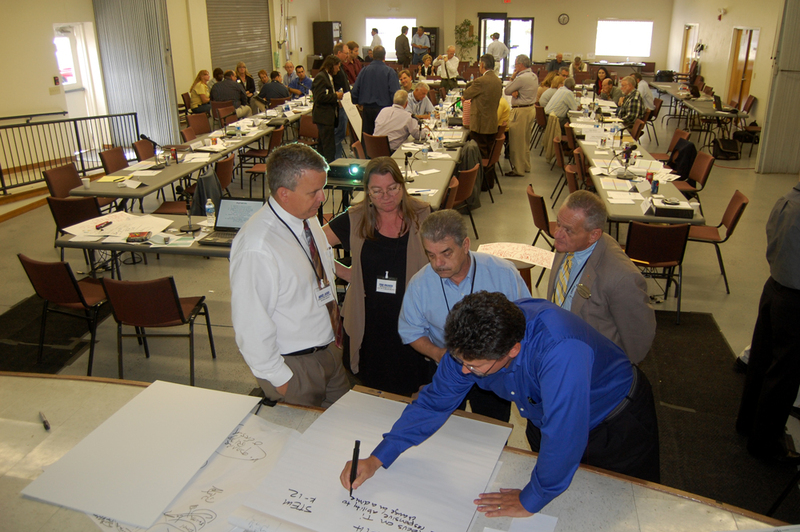 Community Development Corporation as a consultant in the development of a comprehensive land use plan for ‘ The Palm Coast Project’. ( Perhaps the next step would be to use ‘Environmental Planning and Design’ yet again since their designs for ‘The Palm Coast Project’ were successful for decades all last Century but this time they set up a design plan for the whole county). Desalination was at our doorstep. Florida is among those states with the greatest risk of facing water shortages in the coming years, according to a report by the Natural Resources Defense Council. We blew our chance to be the solar capital of the Sunshine State when we threw up housing with rules about sheds and clothes lines instead of being energy efficient. Maybe we still have an opportunity to take advantage of another abundant resource that will soon be in huge demand and use solar energy to power it. There will be a Siting Criteria Public Meeting with Coquina Coast March 9, 2011, 6:00 p.m. to 8:00 p.m. at Whitney Lab in Marineland. 1. This is a unique opportunity to reshape our local economy into what WE want it to look like. 2. Without a strategic plan in place to contain the next economic fad, we will be doomed to repeat ourselves in boom and bust folly. We will succeed because we MUST succeed. That is why I am so optimistic. For free, I would have done the same thing in 10 minutes and they could have enjoyed 2 nice days on the beach instead. I have to disagree with the negativity to this event. Getting all the different factions together without their prejudices or pride getting in the way is not an easy task. It seems Mr Upton is acting as a coach/referee to facilitate this process, walk into any locker room in any sport amateur or professional and you will hear the same clichés being used, they sound familiar but they work. Great. After 50 more meetings over the next few years maybe we can iron out our differences and decide. Business at snail speed. Just like the school boards decisions, waste more money on no decisions. Somebody in the county needs to grow a pair and make a decision. But of course. Maybe we should elect this guy for mayor or city manager or something. Your are correct Val another $7,250, plus a day lost of good labor for better things and only gearing up to impose some kind of new tax to promote blunders. Who was the brain storm about bringing this rocket scientist…Chamber, Enterprise and County Commission? Because for sure were not Palm Coast or Flagler Beach I think. All the fuss to come up with the same slogan and plans as before, at Chamber and Enterprise commands. Why don’t every government body tackle economic development within their existing resources on an individual basis, without asking to increase taxes or trying to create anymore bureaucracy and try at “stop outsourcing first”. I agree discussions need to be had that better define what “economic growth” really looks like and identify targeted goals. I am happy to see the focus on education within that discussion as well. What I’m not getting is Upton? We are paying him for help. We are paying Enterprise Flagler for help. But what are these now two groups really doing? We have tons of retired executive talent in this area who could have provided a “referee” role to the meeting. Palmcoaster, could we please take the Tea Party playbook repsonses for everything and give us a break for a while? It’s getting to be just silly. It’s like you guys just cut and paste the same response for every single discussion. Who is ‘outsourcing’ locally? What taxes were increased locally? What is interesting to me is that the same people from the same etities are talking about the same solutions that have been floating out there for the past four to five years. The issues still remain stagnate at best. I heared discussions about Palm Coast’s large retiree population, but nothing about the large population of young families, as noted by the number of school we have around. It just seems that we need to look at the longivity of Flagler County, not just the immediate need. Did anybody ever asked what would happen if this group of “business” people would succeed with “economic development”? Would that “success” bring more unemployed people to Flagler county to look for jobs? Would that create additional need for new additional developments? When would that magical loop stop and who would pay the price for it? This is a riot, we elect these peaple to do a job, while running for these positions they promise the world, then they hire (pay) someone to basically teach them how to do what they said they could do to get elected in the first place. What a bunch of pretenders!!!!! !